What exactly does one say about the films of Guy Maddin? Being a longtime lover of silent film, I've always found it refreshing to see Maddin's adherence to the style of the silent and early sound era avant-garde in films such as The Saddest Music in the World and Cowards Bend the Knee. His films aren't always silent, but their visual style very much recalls a forgotten art form of a bygone era that is in many ways more beautiful and more impressive than anything we see today. Maddin's latest film, like all his films, is a strange and unique animal. 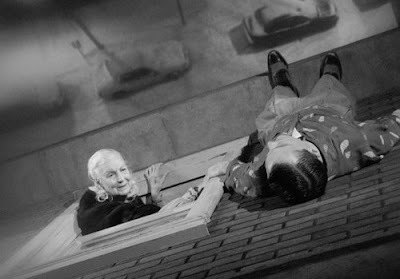 Dubbed a "docufantasia," My Winnipeg is essentially a valentine to Maddin's hometown of Winnipeg, Manitoba, Canada. Using actors to recreate (or fabricate) moments from his childhood, Maddin explores his relationship with his domineering mother (Ann Savage), while going through the long history of Winnipeg as filtered through Maddin's fertile imagination. The film is narrated by Maddin himself, taking a deeply personal journey through a Winnipeg that essentially exists only inside his head. But its roots in reality make My Winnipeg a fascinating exercise. Maddin isn't so much interested showing the real Winnipeg per se, this is his Winnipeg; the Winnipeg of his childhood and the place where he left his heart. My Winnipeg is filtered through the blurry lens of a childhood memory, laced with absurdity, sadness, and a burning possessiveness that often accompanies such memories. It his difficult, if not impossible, to separate the fact from the fiction in My Winnipeg. The entire film is an exercise in extreme subjectivity. But that's the point. Maddin is filming a love letter to what is essentially the heart of his existence. He truly cares about this place, even when he is at turns exasperated and angry with it as often as he is affectionate toward it. He treats it like a member of his family with whom he has a tempestuous love/hate relationship. But no matter what he does, he can never escape the call of Winnipeg. He's not really trying to though. 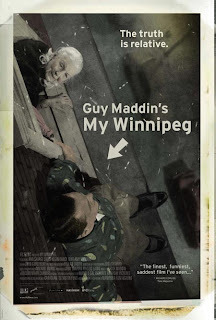 Amid the flat snow covered landscapes of Manitoba, Maddin isn't looking for Winnipeg. He is looking for himself. What he finds isn't so much something that can be articulated or explained, it is an essence, a sense of being and place, a sense of history. The film's structure can at times be off-putting, especially with Maddin's incessant narration, but there are some beautiful images and feelings here. The scene with the dead horses frozen in the river (pictured above) is especially haunting. It is a scattershot film, constantly zipping from one place to another in hyper-kinetic style. But Maddin isn't searching for narrative cohesion, he's looking to embody his feelings toward Winnipeg in a visceral way. And in that regard he succeeds. My Winnipeg is occasionally uneven and often opaque and aimless, but it is clear Maddin knows what he's doing. And by the time it is over, he has transported us not just to Winnipeg, but into the heart and soul of an artist. Well, I must surely check out this film, which can't settle on fact or fiction. Your passion for this director is quite wonderful to behold, and you have written an outstanding piece. A fine review of my favorite crazy Canadian director. I need to see this one as soon as possible. I love Maddin's work. They are impossible to categorize. Thanks for stopping by! I've always found Maddin's films fascinating. Dang it, Matty. I just can't keep up with all of your posts!